The Nashi pear resembles a beige apple, so much so that it is sometimes known as the apple pear. You may also see it sold in your local grocery store as an Asian pear, Japanese pear or sand pear. Whether ripe or unripe, these pears stay firm, so smell this fruit before buying -- the most fragrant pears indicate ripeness. Nashi pears offer a variety of nutritional benefits. One Nashi pear weighing 122 grams and roughly 2 1/4 inches in height and 2 1/2 inches in diameter contains 51 calories. If you wish to add enough calories to make it into an appropriate snack -- the Diet Channel recommends keeping snacks to 100 to 200 calories -- consider adding an ounce of cheese. One fruit provides little protein -- 0.61 gram -- and only trace amounts of fat. You will take in 13 grams of carbohydrates, though, as well as 4.4 grams of fiber, which is 18 percent of the 25 grams of fiber women need each day. 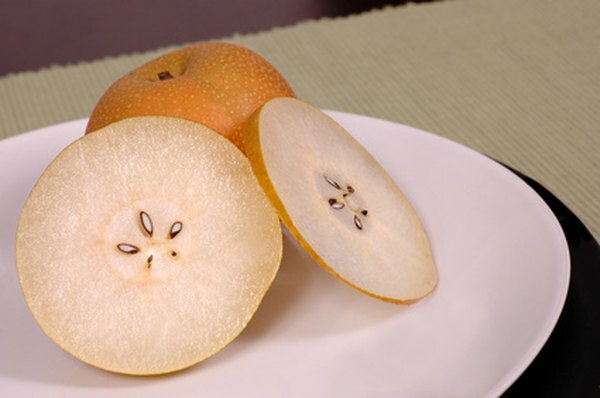 The fiber in a Nashi pear can help prevent constipation and other digestive complaints. Nashi pears are a source of vitamin K, a nutrient needed to help your blood clot. Each pear provides 7 percent of the daily recommended intake. You also take in 8 percent of the vitamin C you need each day. The vitamin C in this fruit helps keep your joints in good working order by making collagen, a key ingredient in cartilage, the substance that helps cushion joints. You'll also get lesser amounts of vitamin E, thiamin, riboflavin, niacin and vitamin B-6. Eat a Nashi pear to get a small boost in your potassium and manganese intake -- each fruit provides approximately 4 percent of the amount your body requires daily. In addition, a piece of fruit contains 3 percent of the daily recommend amount of copper, a mineral critical for the health of your blood vessels and heart. One pear has 2 percent or less of the daily suggested intake of magnesium and phosphorus as well. Including Nashi pears in your diet may offer protection against asthma. A study published in the June 2004 issue of the "Journal of Alternative and Complementary Medicine" reports that studies on mice with induced asthma saw a reduced reaction to asthma triggers. Consult your physician before self-treating your asthma with this fruit, however, as no human trials confirm these findings.